CarGurus has 1,488 nationwide Touareg listings starting at $2,488. Stepping away from its traditional role of providing a wagon for the people, Volkswagen brings its luxury-leaning Touareg midsize crossover back for 2015 with a subtle new look, some added techno-safety features and a few new tweaks to the already posh cabin. It also brings an even higher price tag, perhaps over-straining the budget for those folks looking into VW’s legendary Euro-styled basic transportation. However, this handy hauler, which again rides on a platform shared with Audi’s Q7 and Porsche’s Cayenne, continues to rack up impressive sales figures simply because it’s very good at what it does. For 2015, the 5-passenger Touareg sports a new 4-slat grille, redesigned headlights, upgraded wheel styling, and restyled front and rear fascia. The interior, meantime, gets premium-quality leather, upgrades to the genuine wood accents, and improved techno-gizmos aboard all trims. Speaking of trims, this plush people-hauler returns in the base Sport trim level, the midlevel Lux edition and the flagship Executive variant, not to mention the well-wrought Touareg Hybrid. Furthermore, all trim levels are delivered packing either a gasoline-burning V6, a turbodiesel V6 or, in the case of the Hybrid, a supercharged hybrid V6. Additionally, all trim levels boast standard full-time all-wheel drive (AWD) that combines with the Touareg's sturdy truck-like frame to offer better-than-average off-road and towing capabilities. Meanwhile, cargo area remains a decent 64 cubic feet (with the rear seatbacks folded) in all trims, including the Hybrid. Power-wise, the base engine driving the VR6 versions remains a 3.6-liter V6 that puts out 280 hp and 266 lb-ft of torque under the management of the standard 8-speed shiftable automatic transmission. Look for mileage estimated at 17 mpg city/23 highway from this normally aspirated V6. Curiously, VW recommends burning only premium unleaded gasoline in this capable but otherwise quite ordinary powerplant. Moving up to the Touareg TDI trims, look for the return of the 240-hp 3.0-liter turbodiesel V6 with its impressive 406 lb-ft of torque. Again managed by the ubiquitous 8-speed shiftable automatic, this oil-fueled mill is arguably the most fuel-efficient engine of the bunch, with mileage estimates of 20/29. Upgrading to (and paying for) the dubiously fuel-efficient though doubtless green-leaning Touareg Hybrid means gaining a supercharged 3.6-liter hybrid V6 engine that boasts an electric motor interacting with the standard 8-speed shiftable automatic in putting out a total of 380 hp and 428 lb-ft of torque. Strangely, this gas/electric powerplant’s mileage is estimated at a mere 20/24, significantly less impressive than the TDI’s heady fuel efficiency numbers, and you have to shell out for premium gasoline, too. Appearance-wise, this classy crossover boasts, besides the redesigned front and rear ends and depending on the trim level selected, 18-, 19- or 20-inch alloy wheels, a power sunroof, a roof rack, a power liftgate, and body-color heated power-adjustable mirrors. Inside, look for the previously mentioned styling upgrades complemented by leather upholstery, heated power-adjustable front seats, reclining rear seats, full power accessories, cruise control, and telescoping tilt-wheel steering. A remote garage door opener also comes standard throughout the 2015 Touareg lineup, as do such goodies as Bluetooth hands-free calling and a cooled storage compartment. Meantime, lower trims boast a single-CD player, 8 speakers, satellite radio, a USB port, and a memory-card slot, with all of it interfaced via a touchscreen display. Higher trims, including the Touareg Hybrid, add such standard extras as a power sunroof, a rear-view camera, memory for driver’s settings, a new-for-2015 heated steering wheel, and GPS navigation with an upgraded 8-inch display. Furthermore, the V6 and TDI Executive trims throw a standard side-view camera and a 10-speaker, 620-watt Dynaudio premium entertainment system into the mix. Noteworthy options for the 2015 Touareg stable include upgraded leather, a hands-free feature with the power liftgate and roof rack side rails. The available Driver Assistance Package, meanwhile, has been upgraded to offer safety features like adaptive cruise control, lane-keeping assistance, front collision mitigation, and post-collision braking. Finally, standard safety equipment aboard each 2015 Touareg iteration includes 4-wheel antilock brakes (ABS), front side-mounted airbags, front and rear head curtain airbags, daytime running lights, and front fog/driving lights. Turn-signal-integrated mirrors also come standard across the lineup, along with a post-collision safety system and a remote antitheft alarm. 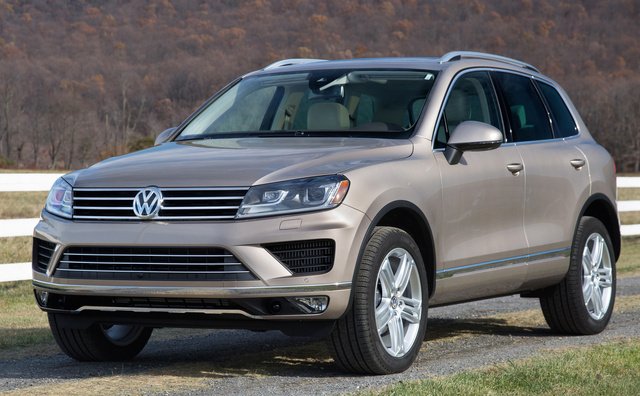 What's your take on the 2015 Volkswagen Touareg? 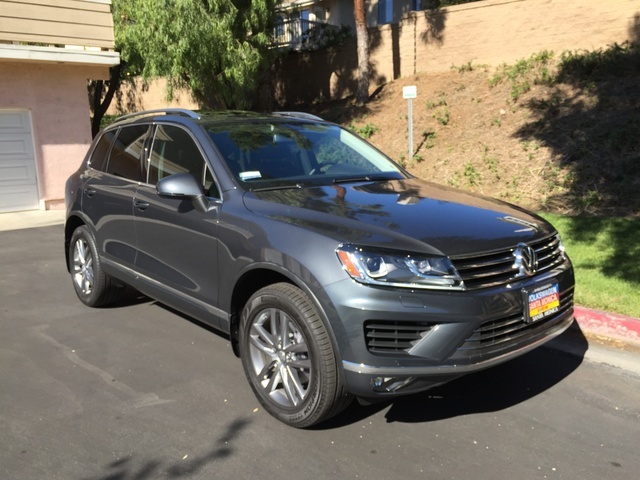 Have you driven a 2015 Volkswagen Touareg?